The term “medical grade” is used often in our industry, although it can mean a variety of things based on specific applications; stainless steel is used across the medical industry for vessels such as sinks, to examination and surgical tools, to medical implants, and while all of this stainless steel is considered medical grade, each application has different material property requirements. For example, the chemical composition requirements of stainless steel used in an implanted device are more stringent than those of material used for a bedpan, although both are considered “medical grade”. The end user must know the ASTM, chemical composition or other requirements for their particular application. 304SS is an economic choice due to its suitability to a wide range of uses. It is highly resistant to corrosion, both high and low heat and scratching (which makes it ideal for hygienic applications), and while very ductile in an annealed temper, its hardness increases with cold working. 304SS can withstand repetitive cleaning and sterilization, is resistant to most staining agents and can be subjected to heavy wear without damage, making it ideal for examination tools. Low carbon stainless steel, otherwise specified as 304L or L-grade, has increased suitability for welding. Vita Needles standard T.I.G. 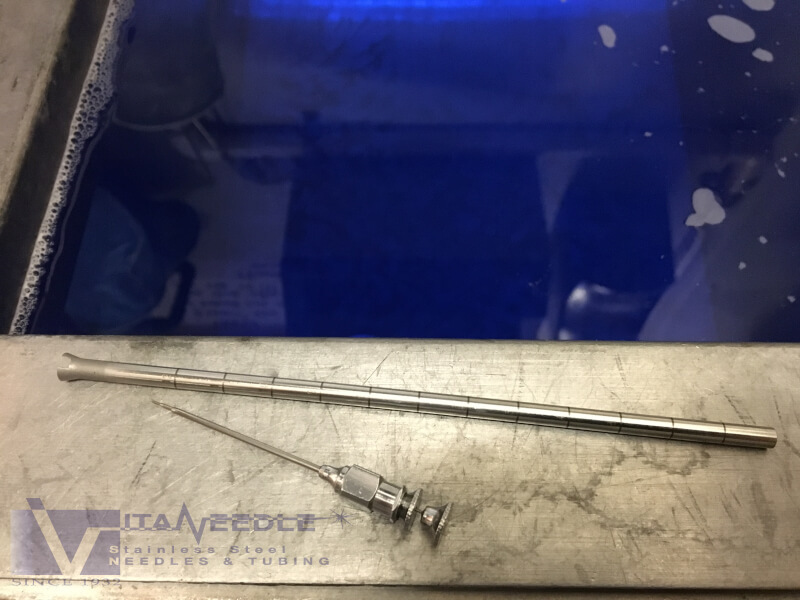 welded and plug drawn 304 stainless steel hypodermic tubing typically has no visible weld seam and can be made to tighter tolerances and with better concentricity than seamless tubing; it is the chosen material for the majority of customers in the medical industry.